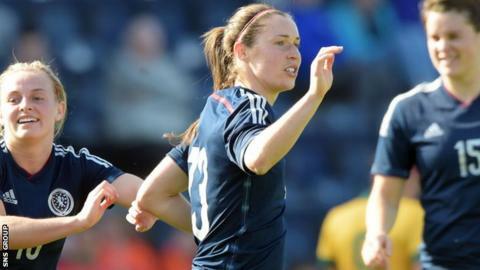 Scotland striker Jane Ross has signed a two-year deal at Manchester City after three seasons in Sweden with Vittsjo. The 26-year-old former Glasgow City player scored 51 goals in 82 games during her spell in Scandinavia. "I've really enjoyed my time over in Sweden; it was more physical, with higher-tempo matches," she told her new club's website. "I think it's going to be similar here in England. It's going to be different again but a very high standard." Ross has been playing for Scotland since 2009, scoring 38 goals in 88 appearances. And she joins international team-mate Jennifer Beattie at the Super League runners-up. "I spoke to Jennifer before I signed and she only had positive things to say about the club," Ross said. "She's really enjoying her time here and it'll be nice to have a friendly face around. "Everything at the club is really impressive - the facilities, the support, the staff. I'm excited to get to work."